Objective Young adulthood is an important transitional life phase where careers are established. Young adults with chronic disabling health conditions are underrepresented in the labour market. Our study aims to examine the effectiveness of work-focused interventions that support the labour market transition of young adults with chronic disabling health conditions; and to examine whether the effectiveness of work-focused interventions differ across work transition phase (eg, preparation, entry and sustaining work, employment advancement) and disability type. Methods A systematic review of articles published between January 1990 and July 2018 was conducted. Medline, EMBASE and PsycInfo were searched, and titles/abstracts and full texts of articles were reviewed for eligibility. Relevant articles were appraised for methodological quality. A best evidence synthesis was applied to medium-quality/high-quality studies to develop recommendations. Results 5816 articles were identified; 10 articles were relevant and of moderate–high methodological quality. Six intervention categories were identified which focused on young adults with mental health or intellectual/learning disabilities (n=3) and addressed employment preparation (n=10) and/or work entry (n=9). No interventions addressed at-work issues or career advancement. Strong evidence existed for tailored supported employment (SE) interventions having a positive impact on preparation and entry into competitive employment. Also, moderate evidence existed for the positive impact of SE on preparation and entry into competitive employment for young adults with mental health conditions. Conclusions Tailored SE is recommended to foster preparation and entry into the labour market. Evidence-based interventions are needed to facilitate sustained work and career advancement of young adults living with different disabling health conditions. The young adult life phase is characterised by vocational transitions that mark entry into and advancement within the labour market. Young adults with chronic disabling health conditions face barriers to finding and sustaining productive employment. It is unclear what work-focused interventions would be beneficial to young adults with different chronic disabling health conditions as they transition into the labour market. Strong evidence existed for tailored supported employment interventions having a positive impact on competitive employment outcomes. Moderate evidence existed for tailored supported employment interventions having a positive impact on competitive employment outcomes for young adults with mental health conditions. Few other evidence-based interventions exist that address the transitional employment needs of young adults with disabling health conditions. To facilitate the transition into work of young adults with disabling conditions, tailored supported employment interventions should be implemented. Additional research is required to examine interventions that facilitate sustained work and career advancement. Young adults living with chronic and disabling health conditions are under-represented within the labour market.1 Of concern, challenges at the early career stage can have a long-term impact on involvement in paid work and affect the ability to access resources (eg, income, nutritious food and safe housing) that provide pathways to better health.2 3 Interventions that support the employment participation of young adults living with chronic disabling health conditions can advance health and quality of life. Our review synthesised evidence regarding work-focused interventions that promote the employment of young adults living with chronic disabling health conditions. Young adulthood, spanning 18–35 years, is characterised by several transitions (ie, discrete vocational changes) that mark entry into the labour market including exiting educational roles, preparation and entry into paid work and advancement within one’s job.4 5 Research indicates that difficulties with employment in young adulthood can have a ‘scarring effect’ and contribute to adverse work (eg, unemployment, missed work days, earning less pay) and health outcomes (eg, psychological distress) that can extend across adulthood.6 7 The current generation of young adults (often referred to as millennials) face unique challenges with employment. When compared with previous generations, millennial young adults possess higher levels of formal education and technological literacy, but are less likely to be employed in full-time permanent jobs and more likely to face income insecurity.8 9 It is within these challenging socioeconomic conditions that young people with disabilities are entering the labour market. Interventions that are work-focused (ie, where the specific intention is to promote employment engagement) play an important role in addressing the physical and psychosocial workplace barriers experienced by people with disabling health conditions.17 18 However, little evidence currently exists which can guide the development of policies and programmes that enhance the employment of young adults with chronic disabling health conditions. Systematic reviews of studies of working-aged samples (≈18–65 years) with different disabling health conditions indicate the importance of multidimensional work-focused interventions that include workplace modification, health and rehabilitation care, supported job placement and work-related training.17–22 Another recent review of studies of vocational programmes of youth (15–25 years) with physical disabilities found that workplace-based training, job-specific mentorship and family engagement were intervention components that had the potential to improve participation in paid and unpaid work roles.23 Of note, the methodological quality of the intervention studies in this review was not reported. Hence, it is unclear what work-focused interventions would be beneficial to young adults with different disabling health conditions as they transition into the labour market. Using a rigorous systematic review methodology, our study examines the following research questions: (1) What work-focused interventions are most effective in supporting the employment of young adults with chronic disabling health conditions? (2) Does the effectiveness of work-focused interventions differ for young adults living with different chronic disabling health conditions (eg, mental health, intellectual/learning, physical and speech/hearing/visual disabilities)? (3) Do interventions and their effectiveness differ across the period of transition into the labour market (eg, preparation, entry, sustaining work and advancement within employment)? We used a systematic review methodology designed to synthesise evidence in the field of occupational health and safety and aimed at generating recommendations for practice.17 Investigative team members had experience with the systematic review process and specific backgrounds in information sciences, epidemiology, social sciences, rehabilitation and health sciences, occupational health and public policy. Embedded within the review process was engagement with relevant stakeholders including young adults with disabilities, employment support practitioners and public policy experts.24 The review protocols, described below, were registered with PROSPERO (CRD42018104550) and align with Preferred Reporting Items for Systematic Reviews and Meta-Analyses guidelines. At the outset, the investigative team and stakeholders participated in a series of consultations where research questions were generated. During consultations, stakeholders expressed a lack of evidence regarding the most effective interventions that could be used to facilitate preparation, entry and advancement within the labour market of young adults with disabilities. Stakeholders also described an absence of evidence regarding whether interventions should differ based on disability type. In collaboration with stakeholders, the study team also decided to examine work-focused interventions within Organisation for Economic Co-operation and Development (OECD) countries which have similar socioeconomic contexts. Search terms were developed iteratively with input from the lead author, information scientist, review team members and stakeholders. All database-specific search terms are available in online supplement 1. Collaboratively, search terms were refined to follow a PICO framework and capture the population of young adults with chronic disabling health conditions, work-focused interventions, comparison groups and work outcomes (table 1). To address our research questions, we searched for any disabling chronic health condition that could affect young adults including mental health (eg, depression), intellectual/learning (eg, attention deficit disorder), physical (eg, juvenile arthritis) or speech/hearing/visual disability. Database-specific controlled vocabulary terms and keywords were included. The terms within each category were combined using a Boolean OR operator and terms across the four main categories were combined using a Boolean AND operator. Medline (OVID), EMBASE (OVID) and PsycInfo (OVID) were searched for articles published between January 1990 and September 2017 to identify work-focused interventions for current and previous generations of young adults with chronic disabling health conditions. The search was subsequently updated in July 2018. Aligning with previous occupational health and safety reviews, research prior to 1990 was considered informative but excluded to account for advancements with workplace, policy and health systems levels that have occurred in OECD countries.18 Non-English studies are indexed in the three databases with English-transcribed titles and abstracts. Accordingly, we captured non-English references using English search terms. Search terms were customised to align with each database’s specific controlled vocabulary. Reference lists of included studies were also examined to identify references not found in the literature search. The search yields were combined in a citation manager software. Once duplicates were removed, titles and abstracts were imported into Microsoft Excel to facilitate the screening processes. Articles were included if they were primary research, published ≥ 1990, focused on a work-specific intervention, within an OECD country,25 and where the sample of interest was young adults (18–35 years) with any chronic disabling health condition. We included studies when the sample’s mean age fell between 18 and 35 years, and age range was <45 years or >16 years. Articles which had a broader age range were only included when sample characteristics and intervention effects were reported for young adults. Our operationalisation of young adulthood aligns with theoretical research on the young adult life phase and enabled us to capture various definitions used in the literature.5 20 Intervention studies could be randomised or non-randomised designs but had to have a comparator or control group.17 All languages were included in our search. Exclusion criteria comprised (1) non-intervention studies (eg, observational research); (2) secondary research (eg, systematic reviews); (3) non-work-focused interventions (eg, clinical interventions where employment was not an intended outcome); (4) commentary/editorial or case studies; and (5) studies where no statistical intervention effect was recorded. While previously published systematic reviews or meta-analysis studies were not eligible, their references were checked to identify relevant articles. Titles and abstracts of references identified in the search were divided among three reviewers for relevance screening, such that each reference was screened by two reviewers independently. A quality control step was implemented to ensure inter-rater reliability and limit bias; 5% of titles and abstracts were examined by two reviewers and findings were compared. Reviewers came to consensus on any disagreements and consulted the third reviewer in cases that could not be resolved. Articles that met the first level of screening were carried forward for a full-text review. Two independent reviewers applied the same inclusion and exclusion criteria to examine each article. Disagreements between the two reviewers were discussed in team meetings. Moderate–high inter-rater reliability was identified in title/abstract and full-text reviews, suggesting that reviewers were consistently applying inclusion/exclusion criteria to the screening processes. Each relevant article was appraised for methodological quality by two independent reviewers. A 25-item quality assessment tool was used to assess study methodological (ie, study design and objectives, level of recruitment, intervention characteristics and intensity, outcomes and analysis)18 (online supplement 2). The appraisal tool has been used in previous occupational health and safety systematic reviews and provided an evaluation of internal, external and statistical validity of each article.26 During team meetings, reviewers were required to reach consensus on the application of the quality assessment tool for each study. Once consensus was reached, methodological quality appraisal scores were assigned to each study based on a weighted sum score of the quality criteria. Weightings were created through a consensus building exercise where members of the research team and study stakeholders ranked quality appraisal criterion based on level of importance with regards to methodological dimensions that were most important to addressing our research questions (1=somewhat important; 3=very important). Weightings are reported in online supplement 2. Using the weightings, a final quality score was generated and converted to a percentage. Studies were ranked as high (≥85%), medium (50%–84%) or low quality (<50%).27 While informative, low-quality studies were ultimately excluded from the review because of their potential risk of bias and methodological limitations. Data from included studies were extracted to create summary tables which included sample description, intervention details and work outcomes. Interventions that used similar mechanisms and conceptual principles were grouped together. The effectiveness of an intervention was determined using criteria that were applied to each study. In particular, a study exhibiting a positive effect was characterised by findings which showed a significantly positive result and either no negative results or no null effects. A negative effect intervention referred to a study exhibiting any negative effect. Intervention effects, quality ratings and number of studies were all considered to determine the level of evidence for each category of intervention uncovered in the review. Evidence was synthesised using an algorithm that considers the quality and quantity of studies and consistency of study findings29 (table 2). The algorithm has been used in several systematic reviews in the field of occupational health and safety18 30 to guide policy and practice recommendations. An intervention that is supported by a strong level of evidence contributes to specific recommendations for policy and practice. An intervention supported by a moderate level of evidence contributes to practice considerations. In contrast, limited, mixed or insufficient evidence levels contribute to a lack of evidence to guide policies or practices. Interventions that were supported by moderate to strong evidence levels were examined further to determine if their effect differed based on disability type or phase of work transition. Practice recommendations were generated in collaboration with study stakeholders to develop specific messages that could be disseminated to knowledge users. Spanning January 1990–July 2018, our search yielded 5816 articles from various databases and after removing duplicates. Following title/abstract relevancy screening, 5185 articles were excluded. Most common reasons for exclusion were studies not focusing on young adults (45%) and/or a specific work intervention (40%). Full-text reviews of the remaining 631 manuscripts resulted in 18 studies being carried forward for quality appraisal. Ten articles of moderate to high quality were identified as relevant for data extraction (figure 1). For three work-focused interventions, we identified two published articles. Multiple articles describing the same intervention were grouped together in table 1, but only the primary article was included in the evidence synthesis. All eligible articles were in English language. Flow chart of study identification, selection and synthesis. Using the quality appraisal tool, three studies were high quality (≥85% of quality appraisal score) and seven articles were of medium quality (50%–84% of quality appraisal score). Five articles were appraised rated as being of low quality (<50% of quality appraisal score) and were excluded from data extraction and evidence synthesis. Consistent across all medium-quality and high-quality studies, reasons for receiving a lower quality appraisal score were non-random selection of the study sample (n=10) and potential for co-intervention (n=10). Intervention articles that were appraised as low quality tended to not adequately describe sample inclusion/exclusion criteria (n=5), baseline sample characteristics (n=3), sample attrition (n=4) or key intervention mechanisms (n=3). Low-quality articles were also characterised by suboptimal statistical analyses (n=5) and did not control for important confounding variables in their analysis (n=5). Of the 10 studies, 5 were randomized trials, 2 were non-randomised trials and 3 used other study designs (eg, cohort studies, post-test evaluation) (table 3). Over half of the intervention studies were conducted in the USA (n=6). The remaining were conducted in Australia (n=2), the UK (n=1) and Japan (n=1). Across the studies, over half had an observation length of ≥ 1 year and ranged from 6 weeks to 3 years. Five main intervention categories were uncovered in our systematic review that support the employment of young adults with disabling health conditions (table 3). Eight studies examined the impact of the intervention on competitive employment, which is defined as meaningful integrated employment that is consistent with a person’s career interests and skills, and where wages are at the market rate.39 Competitive employment was measured dichotomously (competitively employed; not competitively employed). Three studies also assessed employment in any job including part-time or full-time paid work in contract or permanent positions (employed; not employed). Few studies also collected information on job tenure (ie, days employed for pay), employment income (ie, paid weekly earnings) and hours worked (ie, weekly hours worked) (table 4). Evidence was synthesised for each intervention category and specific practice-based messages were generated (table 5). A strong level of evidence existed for SE on competitive employment (three high (H) and four medium (M) quality studies). Practice-based recommendations can be drawn from this level of evidence; implementing an SE programme is recommended for young adults with disabilities to prepare for and secure competitive employment. Moderate evidence was available for the effect of SE on employment in any job (2H and 1M). Practice-based considerations can be drawn from this level of evidence; SE can be considered to promote employment in any job. Findings showed insufficient evidence for the effect of SE on other work outcomes (eg, income, hours worked or job tenure). Also, insufficient evidence was identified for the use of other interventions including SE+, SE and self-disclosure training, YTD and technology-based job interview training. When examining whether interventions differed for young adults with different chronic disabling health conditions, a moderate level of evidence existed for the use of SE to support competitive employment for young adults with mental health conditions (2H and 3M). Thus, SE should be considered as an effective intervention to increase the likelihood of competitive employment for young adults with mental health conditions. There was not enough evidence to support the use of SE for competitive employment of young adults living with other disabling health conditions. There was also insufficient evidence to examine whether the interventions would be beneficial for other phases of the transition to employment. Young adults with chronic disabling health conditions face challenges finding and sustaining paid work and may benefit from specialised support. Our systematic review is one of the first to synthesise evidence regarding the effectiveness of work-focused interventions for young adults with chronic disabling health conditions. Interventions that support the transition into the labour market address a critical social determinant of health and provide young adults with pathways to better health and quality of life. Only a handful of work-focused interventions were uncovered through our systematic review. Among those that were found, sufficient evidence only existed for SE as an effective intervention that can help young adults with disabilities prepare and find competitive employment. Our systematic review underscores the need for additional development and evaluation of interventions that would support young adults with disabling conditions as they enter the workforce and advance within their careers. A main finding from our study was the limited number of medium-quality to high-quality intervention studies which addressed the employment needs of young adults with chronic disabling health conditions. Only 10 intervention studies were identified from our systematic review, a majority of which were based in the USA. Most intervention studies focused on preparation and entry into employment. Outcome measures examined in the intervention studies tended to focus on whether or not a participant was employed competitively or in any job. No studies examined at-work outcome measures (eg, absenteeism or presenteeism) or career growth (eg, job promotion, changes in income or seniority or perceived quality of employment43). Findings suggest that there is minimal high-quality evidence to guide the development of approaches for the long-term employment of young adults with chronic disabling health conditions. There is a need to further develop and evaluate interventions that address the unique transitional work experiences of young adults with disabling health conditions using randomised trials of representative community-based samples. Notably, sufficient evidence existed to recommend the use of SE to facilitate preparation and entry into competitive employment for young adults with chronic disabling health conditions. SE interventions identified in our review were multidimensional and included several common features such as competitive employment placements, job coaching, collaboration of a multidisciplinary research team and changing workplace attitudes towards employees with disabilities. It may be that the cluster of SE services are effective in addressing the physical and psychosocial barriers that young adults with disabling health conditions face at the early career stage.20 Of the SE intervention studies uncovered in this review, observational lengths ranged from 6 weeks to 2 years. It is unclear if SE can be helpful for young adults to sustain employment. Studies are required to expand on findings by examining the effect of SE on longer-term work experiences. Additionally, studies are required within a broader range of OECD countries to further investigate the effectiveness of SE in different contexts. 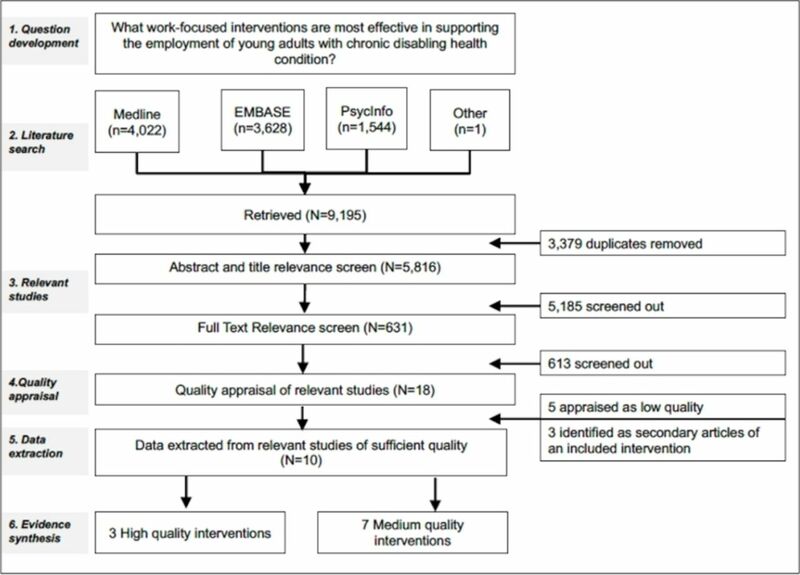 Interestingly, several interventions included SE in combination with a disability-specific intervention (SE+).31 38 Although there was not sufficient evidence from our systematic review to support SE+, tailoring work-focused interventions to a particular disability has the potential to enable a young person to better navigate specific employment challenges they may encounter. Research is needed to examine the efficacy of SE+ interventions on the employment of young adults with different disabling conditions. Lastly, only one intervention identified in our review specifically addressed policy-level conditions to support the employment of young adult with disabling conditions.41 Some studies indicate that policy-level factors such as the loss of disability benefits represent a commonly reported disincentive to entering the labour market for people with a disability. Interestingly, Farkar et al offered social assistance waivers to young adult study participants so that they could participate in a job placement and training programme without loss of income support.41 Participants who received the combined intervention were more likely to hold paid employment and report greater income compared with the control group. Additional research is required to expand on the role of policy-level interventions in influencing the employment participation of young adults living with different chronic disabling health conditions. For young adults with chronic disabling health conditions, the transition into the labour market plays an important role in determining working experiences across the life course. Our systematic review of work-focused interventions suggests that young adults with disabling health conditions may benefit from SE. It is recommended that practitioners implement SE as an intervention to support preparation and entry into competitive employment. At the same time, findings also suggest an overarching absence of interventions of high methodological quality that address the needs of young adults with disabling health conditions as they sustain employment or advance within their career. Also, limited interventions existed for young people with physical or speech/hearing/visual disabilities. In conclusion, there is a need to further develop interventions which support the employment of young adults with chronic disabling health conditions. Enhancing our understanding of work-focused interventions will provide an evidence base that can inform strategic policy and programmatic design, and offer tailored approaches for income generation and health promotion. The authors would like to acknowledge the support of Emma Irvin, Dwayne Van Eerd and Kimberly Cullen at the Institute for Work and Health for their support implementing the systematic review methodology. We are grateful for the support of Joanna Liu for her assistance with the literature search and article retrieval. We would also like to thank all of the study stakeholders who contributed to the systematic review process. World Health Organization. In: Hartley S , Ilagan V , Rosamond M , eds. World health report on disability et al. Switzerland: GenevaWorld Health Organization and World Bank, 2011.
. Emerging adulthood: the winding road from late teens through the twenties. New York, NY: Oxford University Press, 2004.
. Rising Youth Unemployment During The Crisis: How to Prevent Negative Long-term Consequences on a Generation? OfEC-oa D , OECD Social, employment and migration working papers. edn. Paris, France, 2010. U.S. Department of Justice CRDPAS. The Americans with Disabilities Act : Title II technical assistance manual : covering state and local government programs and services. Washington, D.C.: U.S. Dept. of Justice, Civil Rights Division, Public Access Section, 2005. Ontario Human Rights Commission. Human rights at work. 3rd Edn, 2008. Canada S. A profile of persons with disabilities among Canadians aged 15 years or older, 2012. Ottawa, ON, 2017.
. Persons with disabilities and employment: Statistics Canada, 2014.
. A systematic review of vocational interventions for youth with physical disabilities. factors in studying employment for persons with disability: how the picture can change: Emerald Publishing Limited, 2017:181–202.
. Experimental and quasi-experimental designs for generalized causal inference: Houghton Mifflin Boston, 2002. Institute for Work and Health. Evidence and quality saying what works clearly!. Toronto: Institute for Work and Health, 2007. Child and youth care forum. Adapting the individual placement and support model with homeless young adults. Springer: Child and youth care forum, 2012. Contributors AJ, RS, MG, MAMG and KAMG were involved in study conceptualisation, methodological design and stakeholder engagement. AJ, RS, QM, MG, MAMG and KMG developed systematic review search terms. AJ, RS, AS, QM performed title/abstract and full-text reviews. AJ, RS and AS conducted appraisals of methodological quality. All authors contributed to manuscript development. Funding This work was supported by a Partnership Grant from the Social Sciences and Humanities Research Council of Canada (#895-2013-1021) for the Canadian Disability Participation Project.